Alpine skiing is an exercise in dynamic balance. Skiers need to be able to decelerate their bodies against gravity while maintaining balance and control, often at high velocities. Skiers must be able to rapidly adapt to variations in terrain, and must be able to function in all planes of movement. This requires strength, flexibility, power, and endurance throughout the entire kinetic chain. While most skiers focus on lower body strength, many training programs ignore upper body strength, core strength, strength exercises in the transverse plane, agility, and explosive power. You are only as strong as your weakest link! Although every individual is different, there are common muscle imbalances seen in alpine skiers. Muscles that are commonly tight and need to be stretched include: glute medius & IT band, gastroc/soleus complex, quadriceps, hip flexors, pectorals and anterior shoulder girdle. Muscles that are commonly weak and need to be strengthened include: gluteals, VMO, hip adductors, hamstrings, tibialis anterior, trunk stabilizers such as spinal erectors and abdominals, posterior shoulder girdle and scapular stabilizers. Imbalances may need to be addressed not only to improve skiing performance, but to prevent injury. 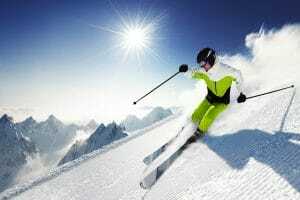 Components of a properly designed skiing program include flexibility, strength training, balance and agility, plyometrics, aerobic and anaerobic cardiovascular fitness. Many common skiing injuries occur because of fatigue at the end of the day. Knee and leg injuries get a lot of attention, although injuries to the thumb (bracing a fall with your hand) are probably more common. Injuries can be minimized by skiing with properly maintained equipment and skiing within your ability at all times. Option 1.The most effective option is to work one on one with a professional Strength and Conditioning Coach to ensure that you are doing the most efficient exercises correctly. You will first have an assessment to determine your current cardiovascular fitness, flexibility, and muscle strengths and weaknesses prior to beginning a training program. K’s Body Shop will then utilize that information to design a customized program that determines appropriate exercises and intensities so that you can maximize your skiing performance and minimize the chance for injury. Since there are no contracts, you can work with your trainer as often or as little as you please. Contact K’s Body Shop to schedule your appointment or get more information. Option 2. If you have a group of skiers in the Twin Cities area who are interested in having a professional Strength and Conditioning Coach oversee your small group strength training workouts, contact K’s Body Shop. This is a great option for training partners to contain costs while still getting some professional instruction. Since each athlete is different, the workouts will not be completely customized, but you will have the option of discussing appropriate exercise progressions based on your abilities. Prices vary depending on number of skiers and location of sessions. Option 3. If you are comfortable with technology and relatively healthy, Online Coaching can be a cost-effective alternative to face to face training. Check out our free trial to see how the software works! Contact the Coach if you need help deciding which option is most appropriate for you.